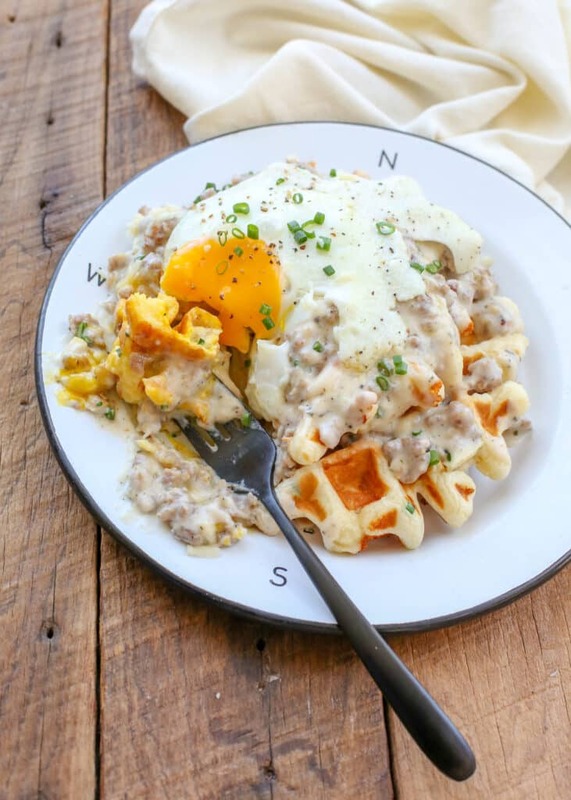 Cheddar Chive Waffles topped with Sausage Gravy and a perfectly soft fried egg? There is nothing I did not absolutely love about this breakfast. I have a fairly well-known love for savory waffles and this combination proved irresistible. My beloved Sausage Gravy has an unexpected depth of flavor from plenty of fresh rosemary and it is truly the best sausage gravy I have ever tasted. I’m not alone in that either, because everyone who has ever tasted it raves over it. I had the idea to pour the gravy over waffles a couple years ago, similar to Biscuits and Gravy. 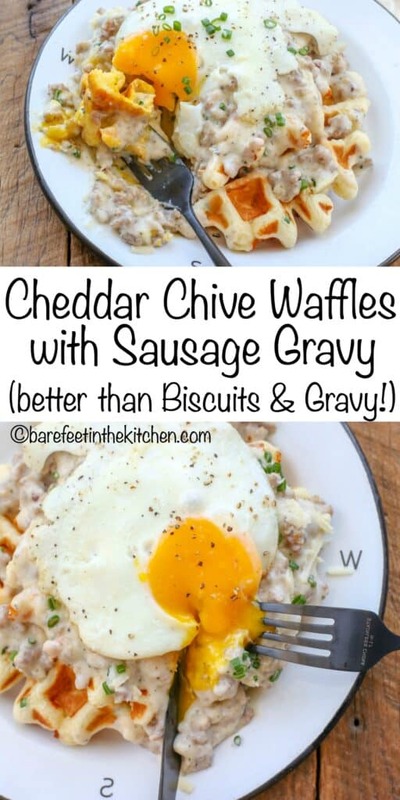 I served buttermilk waffles with sausage gravy a couple of times and really liked the combination. If you aren’t up for a full gravy breakfast, the waffles are absolutely delicious on their own. I typically make extras to freeze. We toast them later and eat them out of hand. Sometimes, I serve the simple waffles with soft eggs on the side for dipping. Savory waffles are my thing these days and there are countless variations that I know you’re going to love. I actually have a couple more waffle recipes saved to share soon. 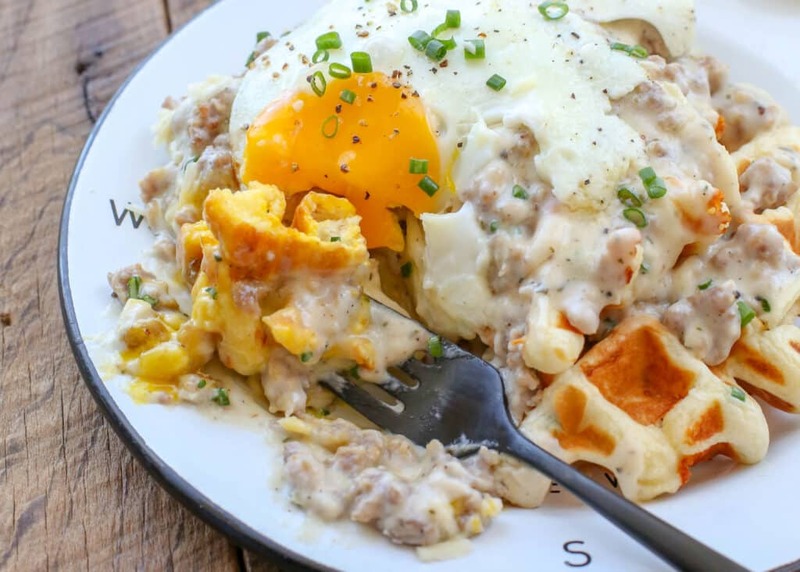 We all love a hot breakfast and because waffles freeze beautifully, they make it possible to have a hot meal ready to go in the morning with very little effort. 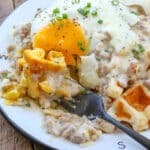 Here are a few more savory waffles that you’re sure to love: Ham and Cheese Waffles have been my go-to freezer meal for over a year now. I probably eat one of these for breakfast a couple times a week. Whole Wheat Zucchini Waffles are a savory-sweet combination that’s great all year round. Turkey and Gravy Herb Waffles and Herb and Goat Cheese Waffles are both on my must-try list! Preheat the waffle iron. Stir together the flour, salt, and baking powder. Add the milk and eggs. Whisk to combine. Stir in the butter. Add the cheese and the chives and stir once more. Pour batter onto the hot waffle iron and cook until lightly browned. When finished cooking, transfer the waffles to a wire rack on the counter. While the waffles are cooking, start making the gravy. When the gravy finishes cooking, remove from the heat, and serve immediately over the waffles. *Gluten-Free Alternative: 1 1/3 cups brown rice flour, 2/3 cup tapioca starch, and 1/4 cup potato starch may be substituted for the all-purpose flour listed in the above ingredients. I can't wait to try this! I love your ham and cheese waffles so much! Looks so yummy with the gravy! Did I miss when to incorporate the cheese? Good catch! I've corrected the recipe. Thank you, LuAnn!